Map of Tapajós River Basin in Brazil. The São Luiz do Tapajós dam is the first of four slated to be built on the Tapajós River. This first dam would block the river, creating a reservoir that would submerge an area nearly the size of New York City – including important parts of the Sawré Muybu Indigenous land. As a result the invitation for bids for contracts to participate in building the dam – set for August – has recently been postponed by Brazil’s interim president Michel Temer. But the change to a government that is hostile to environmental licensing means the political weather is again uncertain. “The government says we don’t exist in this land. The government doesn’t want to recognise us,” a softly-spoken young Munduruku woman (who prefers not to be named) tells me. That may be why Maurício Tolmasquim, president of the Energy Research Company – which is part of the Brazilian Ministry for Mines and Energy – has denied that the Munduruku have lived on the land for any longer than 30 years or so. A Munduruku boy is painted with natural stain paints made from fruit. An archaeologist from the Federal University of Para, Bruna Rocha, has found ceramics on the territory dating back 1000 years, painted with similar patterns to the ones the Munduruku use for their symbolic body paint today. “For us this land, this earth, is very important,” says Chief Arnaldo Caetano Kabá Munduruku, the Chief-of-Chiefs of the Munduruku people. He wears traditional Munduruku beaded straps across his chest made from seeds, and a red feather cap – traditional for important occasions. Cacique Arnaldo photographed at Sawré Muybu Village. “God gave it to us, to care for her and preserve her forever. We take care of our land. We always nourish her. She nourishes us every day, us and our children,” he says. The Munduruku people – who number around 12,000 in total, all along the Tapajós River – say that they are living in a state of war. “The people in the village are always worried about this. We go to sleep worrying about this, we don’t sleep well worrying about this business,” says Chief Arnaldo. So they are “self-demarcating” the Sawré Muybu land, with the hope of prompting official approval from the government. To do this they are putting up signs around the perimeter of a 700 square mile expanse of Amazon jungle. It is arduous and dangerous work, especially on the so-called “dryline”, the border deep within the forest where small-scale gold miners and illegal loggers lurk. Gold miners – already numerous in this part of the Amazon – use mercury in their prospecting, which runs into the river. Mercury is poisonous to humans. More roads, such as those used to transport machinery to dam construction sites, will mean more mining and logging. The Belo Monte is now the third-biggest by installed capacity in the world, after the Three Gorges dam in China and the Brazilian–Paraguayan Itaipu dam. Construction has just been completed. “We have been there and we saw it with our own eyes, what the dam has done to the fish. Everything is finished there. We went there and didn’t see any nature there,” says Chief Valto Datie Munduruku, the chief of a neighbouring village within the Sawre Muybu. 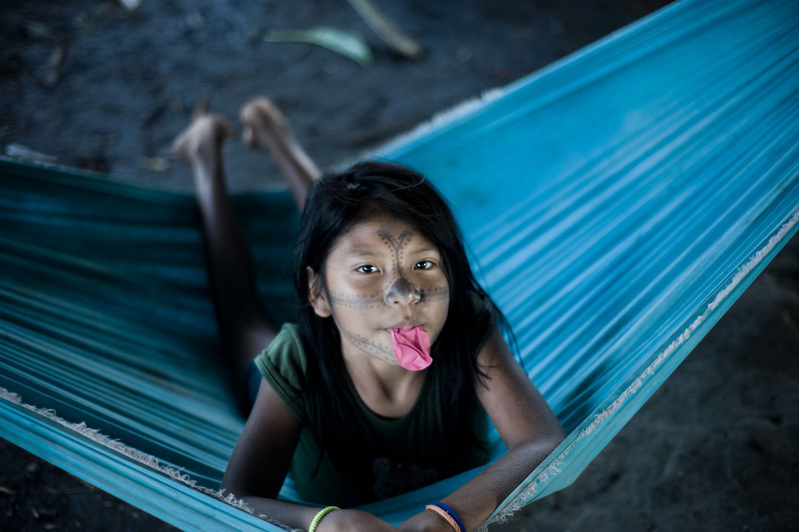 Indigenous people impacted by Belo Monte – such as the Kayapó and the Juruna, among others living in the so-called Xingu Bend – were not consulted before its construction. This was because their land was not going to be directly flooded by the project. “There are still a lot of dead fish appearing every day on the river,” says journalist Sue Branford, after visiting the area last year. “They are sending out boats every day collect dead fish. One biologist told me ‘You can see the fish coming up for air; they can’t breathe because water is so polluted’”. Federal prosecutor Thais Santi considers the destruction of Indigenous people by the Belo Monte project so severe that she has called it “ethnocide”. She is bringing a charge against the Brazilian government. The Munduruku were among the most valiant in their efforts to protest against the construction of the Belo Monte. They are now determined to protect their own land. The fish are also important. At the Garganta do Diabo, or Devil’s Throat, rapids form at the meeting of two rivers, where fish migration patterns deliver abundant food for the Munduruku once a year. Soon, it could be completely covered by the 7.6 kilometre-long, 53 metre-high São Luiz dam. “The government is trying to lie to our people. They have not come here to the village to have the consultation, the conversation, about what is going to happen,” says Chief Arnaldo. The whole community – apart from the children, who play with monkeys and parakeets, remaining blissfully unaware of the crisis – are locked in the struggle. And the women are among the most determined to ensure they can stay on their land.